I’M getting to like AENA – and not only for the successful and efficient way it runs Spain’s airports. It also makes an impressive case for remaining outside the grip of the privateers. The Rajoy government is bent on selling off AENA, which is responsible for all but a handful of the country’s airports. Among the exceptions are controversial white elephants like Castellon, Ciudad Real, Lleida-Alguaire and now the deserted Corvera, where £200m of investment has yet to reap a centimo in return. The argument for a public AENA is convincing – particularly when its workers and supporters put their case so politely (UK trade unions please note). When I flew from Alicante to the UK last week, around 30 pro-AENA actiivists were demonstrating on the main concourse. Neatly but casually dressed, they were scrupulously well-behaved as they paraded up and down to a chorus of megaphone chants. Their message – delivered via leaflets in English and Spanish – made it clear who they blamed for the untold woes of Spanish aviation. In a word, it was civilised. Like many of those on the concourse, I initially took the 30-strong party for football fans. They were in fact workers from airports as widespread as Bilbao, Madrid, Palma, Malaga and Tenerife. And their message? ‘‘AENA is a public company that does no cost anything to the citizens. Not funded by the State Budget, but with rates and economic activity that is generated at airports. 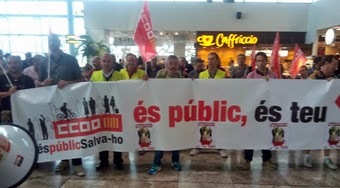 Last year, AENA made a net profit of €715m, according to the protesters, yet the government wants to privatise it. This, say the workers, would reduce investment, leading to airport closures, increased fares, and reduced quality and safety. . I have mixed feelings about trade unions, legacy of 30 years on the receiving end of print industry jealousy. But I’d rather enthuse about the way the protesting CCOO workers conveyed AENA’s viability to passengers and airport workers. Journalists were the favourite targets of the Bolshie bullies who intimidated Fleet Street until the Warrington-Wapping revolution of the mid-1990s. The printers earned more than journalists, legacy of their ‘down-tools’ militancy, but it rankled that they could never put the might of the pen to the sword. Ultimately, the printers were hurled en masse onto the scrapheap by Rupert Murdoch and Eddie Shah, whose newspaper empires were being bled dry by the militants. Shah showed his own credentials by launching a new low-budget tabloid daily, The Post, and closing it within three months. A quarter of a century tlater, The Post’s staff writers and sub-editors are still waiting for our contracted severance pay. We’re more likely to get a cheque from the Shah of Persia than from Eddie. YOU don’t need to look far to appreciate that customer satisfaction is massively important to AENA. And that Britain’s privatised airports care only about lining their shareholders pockets with as much of Mr Average’s hard earned as possible. Park in the short-stay at Manchester to make a pick-up and if the flight you’re waiting for is delayed, it could cost you £20 or more. My daughter was fleeced for £15.60 when she collected me from Terminal 2 last Wednesday. And the noose is tightening still further, with ever-tougher measures to prevent people making sneaky pick-ups outside the terminals without paying. Contrast that scenario with Alicante airport, where vehicles are regularly left unattended in the pickup zone for what seems like hours. I prefer to take take the safe option and use the official car park. The most it has ever cost me is around €2.50, which is roughly what the fare SHOULD be. Unless you are a greedy British fat cat, that is.